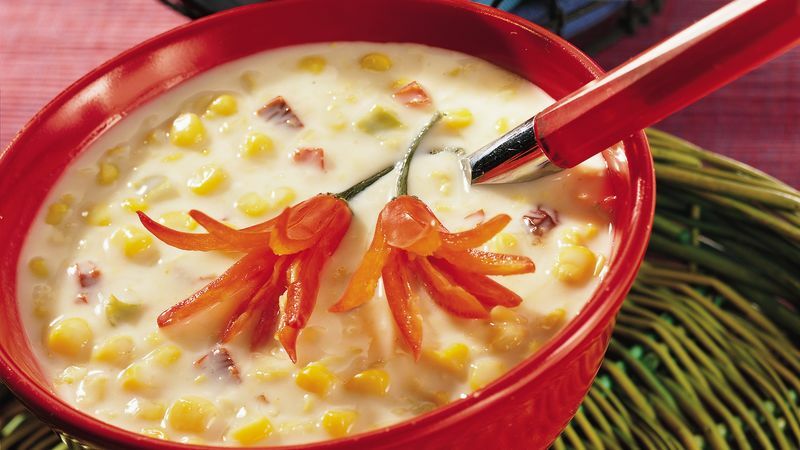 In 2-quart saucepan, combine cream style corn, corn with peppers, chile, adobo sauce and cumin; mix well. Bring to a boil over medium-high heat, stirring frequently. Reduce heat; simmer 5 minutes to blend flavors, stirring frequently. Meanwhile, in small bowl, combine 1/4 cup of the milk, flour and salt; beat with wire whisk until smooth. Add remaining 2 cups milk to chowder. Stir in flour mixture until well blended. Cook over medium heat until bubbly and thickened, stirring constantly. Boil 1 minute. Make quick work of blending the milk and flour mixture in this and other recipes. Invest in a small jar with a tight-fitting lid. When it's time to mix this common thickening mixture, just measure, cover tightly and shake until blended!